Monstrous Movie Music is a record label specialising in the recreation of scores from classic monster movies, often those where the original recordings are no longer available or of poor quality. 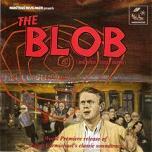 "The Blob" however is a suberb release of the original movie tracks with many extras included. For those unfamiliar with the film, it came out in 1958 starring a young Steve McQueen playing a teenager though the actor was 27 at the time. The film is well-named as it stars a blob shaped monster which lands on earth and terrorises the inhabitants of a town while steadily growing in size. Like many old monster movies the film has a cult following, but succeeds in rising above the typical quality of some of the B movies coming out at the time. The film also has a very catchy title song written by Burt Bacharach with lyricist Mack David (brother of Hal David who later teamed up with Bacharach). The song is amazing and gently mocks the monster film genre, designed to appeal to the teenage cinema-goers of the time, and replacing the title music written by score composer Ralph Carmichael. Both the song and the original title music are on the album. In contrast to the jokey title song, the original Main Title and score music treat the film seriously with many dramatic and scary moments as the Blob attacks a succession of victims. There is also a Love Theme for Steve McQueen and his girlfriend. This was written by Jean Yeaworth, the director's wife, and orchestrated and arranged by Carmichael to suit the various scenes where it is used. One of the hallmarks of the Monstrous record label is the amount of research that goes into their albums. "The Blob" is no exception with a 14 page booklet which covers the music in fantastic depth. So it is we learn that for budget reasons, Ralph Carmichael was limited to an orchestra of just 27 players and the whole score was recorded very quickly indeed to save on costs. The booklet describes each cue and its instrumentation, where it is used in the film and the effect it creates. While interspersed with some romantic cues, the music in the film starts off generally creepy and suspenseful, with some isolated and lonely cues, before the nature of the Blob becomes clear and there are then more moments of horror and action. "The Blob" soundtrack consists of 28 relatively short tracks, and the album is rounded off (making a total of 57 tracks!) with a number of tracks by various composers (including Roger Roger, A. F. Lavagnino, well-known Italian composer Mario Nascimbene, and others) from the Valentino Production Music Library which provided music in many styles for films of the day. The final tracks on the album are bonus tracks by composer Ralph Carmichael which were recorded for "The Blob" or feature briefly as source music in the film. In summary this album is a superb release which has been meticulously put together by people who clearly care very much about the music. You can find more details, listen to audio samples and order "The Blob" and other monstrous soundtrack albums directly from the website of Monstrous Movie Music at this link www.mmmrecordings.com.